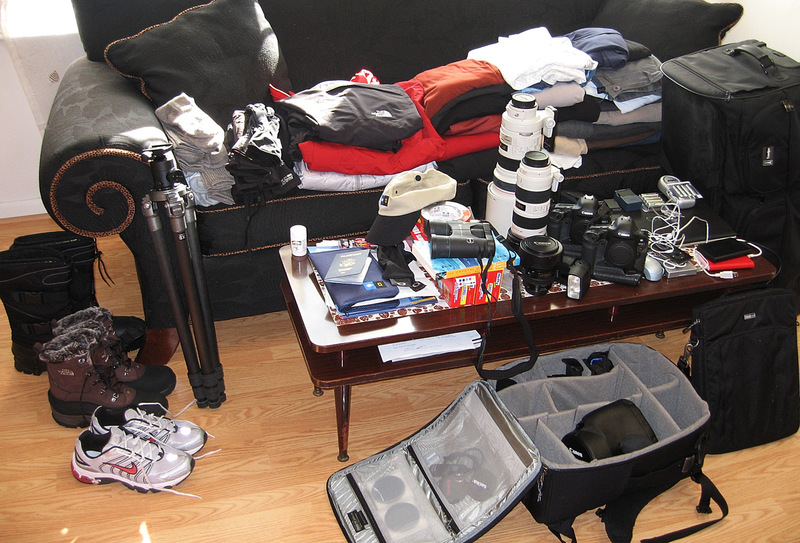 It is time for my least favorite part of the trip – packing all my junk. I’ve already cut a lot out, and I’m still scratching my head on how I’m going to fit this mess in 2 bags. 2 Gallon Ziploc bags and 2 rolls of waterproof duct tape. I can MacGyver anything now! In all seriousnous, the bags and tape are for sealing up camera gear against the elements and wet zodiac landings (or the worst: my camera bag going into the drink). I have a feeling the duct tape might come in handy for sealing up the tops of my boots when we’re jumping out in a few feet of frigid water to get on land. I am packing extra wool socks too. I will be bringing an extra pair of quick-dry wool socks on every landing because there is nothing worse than being stuck with wet feet in the cold. As for camera gear: 2 SLR bodies, and a lens range from 24 – 840mm (with 2 teleconverters on the 300mm f2.8). 5 batteries between the 2 SLR bodies and 3 batteries, just because they’re tiny, for the point and shoot. Then 12 rechargeable AA’s for the flash and computer gear. My tripod is going to take up a lot of room in the bag, but it is the key ingredient to taking good pictures – I’d leave my underwear at home before leaving the tripod behind on this trip! Computer gear: gotta have Photoshop, so a decent laptop is a must! Between the laptop, external hard drives, iPod, and memory cards I’m at 1 Terabyte of storage. That’s a lot of photos with plenty of back-up….I hope I didn’t just jinx myself. I’ll be lugging about 30-40lbs of gear on my back and can hopefully keep below the 2nd tier weight level for checked baggage on United Airlines. For those of you who want to see some photos, I want you to think about me hiking on sand, through glacial rivers, around glaciers, on wet rock, in snow, through airports, up mountains for miles and miles with about 40lbs of gear and numerous layers of clothing (probably wet) all in the <insane> name of “getting the shot” for you. I hope you can’t fit all that stuff in your bag. I hope you step in penguin poo. I hope you have one hard time carrying all that stuff up the mountain. I hope you get uncomfortably wet everyday! Just kidding – I’m just super jealous. I hope you have the time of your life! I hope you get great weather, and can stay dry in the cold. But most of all – I hope you remember to take the lens cap off because I want to see some pictures!!!!!!!!!!!! I promise I will step in penguin poo, but the penguin poo doesn’t worry me. I’m more concerned about those giant albatross flying over head with a stomach full of squid! I promise I will be dying to put my camera gear down after a long hike. I promise I will get wet. I promise I will have a hard time sleeping (loud engines, little night, crammed room, rocking seas). I promise I will get bored on lay-overs. I promise I will be cold. I hope you can’t fit all that stuff in your bag. I hope you step in penguin poo. great photo of yourself.